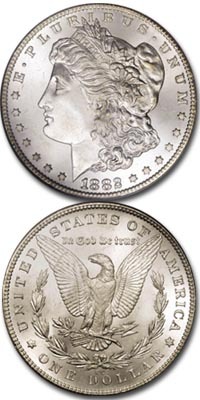 The Morgan Silver Dollar is America’s most popular collector coin. Minted in huge quantities between 1878 and 1904, and again in 1921, over 650 million pieces were struck. The coin features a stylized portrait of Liberty on the dated side and an eagle with outstretched wings on the reverse. Its designer was George T. Morgan. The large mintage was caused by an Act of Congress that wanted to please the silver mining interests. Congress required the Treasury to purchase up to four million ounces of newly mined silver each month and mint it into dollar coins. In 1918, Congress reversed itself and caused over 270 million pieces to be melted. Other meltings took place through the years but it is likely that more than 300 million pieces still exist. Because many coins sat for years in Treasury vaults, Morgan dollars are available in virtually perfect, blemish free uncirculated condition for as little as $250. Vast quantities of the more common dates exist today in uncirculated grades. Even many rarer dates are available in the higher grades. The enormous popularity of the series with collectors, however, keeps prices strong. In average circulated condition the rarest dates are the 1885-CC, worth $400, the 1889-CC, worth $500, the 1893-S valued at $3000, the 1894, worth about $1000, and the 1903-O, valued at $225. In uncirculated condition, the 1879-CC, 1893-O, 1895-S, 1901, and the 1903-S are valued from $1500 to $3000 or more. Also in uncirculated condition, the 1884-S is worth $4000 and the 1889-CC is worth about $17,000. The top uncirculated rarities are the 1892-S, worth $26,000, the 1893-S, worth $60,000+, and the 1895-O, which is in the $12,000 range. The 1895 issue, of which all known examples are from the 880 Proofs minted, are valued at $20,000 and up. In the mid to late 70’s the General Services Administration sold the bulk of the remaining dollars still left in Treasury vaults. Almost three million pieces were sold, most bearing the double “c” mintmark of the Carson City Mint. These coins were packaged in sealed plastic containers and sold for between $15 and $60 each. All of the coins are worth many times that today.